London’s Covent Garden district is not short of restaurants. Lots of them are links in British and international chains (anyone for Shake Shack? ), but there are plenty of excellent independents too. One of the newest is Cora Pearl, named after a woman whose dates were 1835-86 and whose occupation Wikipedia gives as “courtesan.” A sister restaurant, Kitty Fisher, also takes its name from a scandalous woman, albeit one who had her portrait painted by Joshua Reynolds. Evidently, this is meant to evoke the high life of ages past. But apart from some Beardsley-esque artwork there’s little about the restaurant that’s backward-looking. 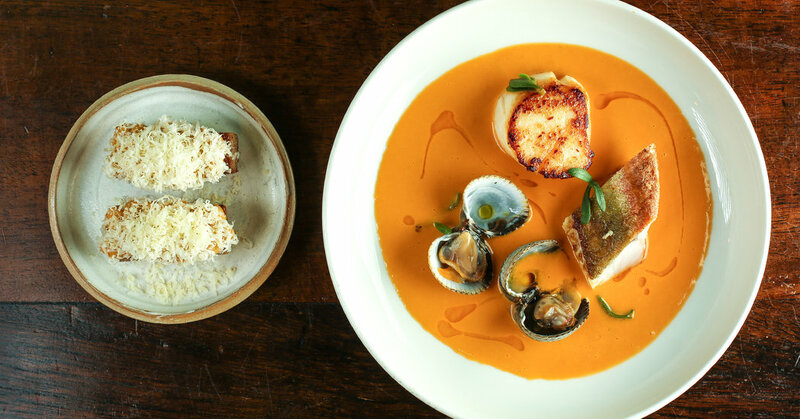 The food of head chef George Barson is of the moment, with appealing seasonal dishes that sometimes turn out to be more complex than they sound, but with no fuss or flash. “Pork & Turnips,” for instance, is presa — a cut from the shoulder of Ibérico hogs — grilled to a precise medium-rare; it’s dense and tender, smoky and juicy, with a big, meaty flavor we don’t always associate with pork. But the turnips are what keep the kitchen busy. Some are pickled, some mashed, some cut into wedges and grilled. Mr. Barson said that the vegetable will change with the seasons; this turnip version, served at an early-October dinner, will be hard to top. “Cod & Spiced Crab” also sounds straightforward, yet the briefly cured cod is finished with curry butter, topped with crab meat bathed in spicy hollandaise, and accompanied by several preparations of cauliflower. And what could be simpler than “Chips,” as in French fries? Well, like a number of other chefs, Mr. Barson has been tinkering with this irresistible staple: His version is a composite of many thin layers of potato that’s cooked, allowed to set, cut into French fry shapes and fried splinteringly crisp. Do not fail to order a portion. One dish that does glance back to Cora Pearl’s day is “Brown Shrimp Ranhöfer,” named for the 19th-century chef of Delmonico’s in New York who might or might not have invented Lobster Newberg. Here, Mr. Barson binds tiny shrimp with mayonnaise spiked with mustard, smoked anchovies and herbs, and piles them onto substantial croutons, to be sprinkled with mini-confetti of dehydrated chilies. Another well-balanced starter is cow’s curd agnolotti with Jerusalem artichokes two ways (puréed and as crisp chips). The filling is marred by a hint of truffle oil — domineering even in these small quantities — but the dish is redeemed by the subtle artichokes, by the fresh flavor of the cheese and by splashes of aromatic chervil-tarragon pesto. And for dessert there is pumpkin: roasted, puréed and made custardy with eggs and cream. It’s served with spunky ginger ice cream and topped with pecan crumbs for flavorsome crunch. A few minutes’ walk from the Royal Opera House and numerous West End theaters, Cora Pearl is a lively, convivial place for dinner before a show — or better still, afterward, when the conversation and music abate and you can contemplate the hidden complexity of those French fries. Cora Pearl, 30 Henrietta Street WC2E 8NA; corapearl.co.uk; +44 (0) 20 7324 7722. The average price for two people, including service charge, but without drinks or optional tip, is £90 (or roughly $115 at current exchange rates).